What is it? 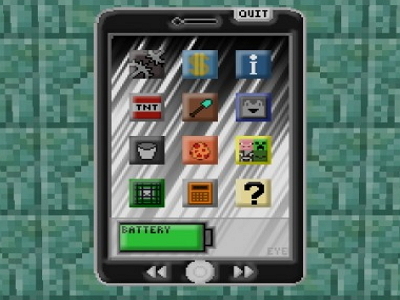 The Eyemod for Minecraft is basically the introduction of an overpowered smartphone into your character's possession at all times, which grants them access to various "apps." These paths allow the player to modify certain things within their possession, grant themselves health, along with other features. Being as this is certainly a cheater mod, it is frowned upon in multiplayer games, but if I daresay it makes for a lot of fun running around overpowered brick in your pocket ALL THE TIME. Allot of items.Mine app: Spawns various oresSpawn app: spawns pretty much any NPCTeleportation app: well that’s self-explanatory isn’t it?Magic app: Grants potionsStats app: Lets you alter your statsMusic app: let you stream in game music, now you don’t have to play all of that crap musi your parents still hate though alternate speakers.There are a few others but if this has piqued your interest by now, then you’re seriously going to miss out on all the fun. Why you need it.In my the only one that feels like having an eyephone in Minecraft would make me feel a lot safer. I mean my smartphone is practically my brain already, why should I have to leave it behind when I jump in to a videogame? It is necessity? No. But is it a whole heck of a lot of fun. I think we both know the answer that question already.